Now the new season surge is completed, I'm finally having some time to complete some series I wanted to finish from previous season and share some thoughts. 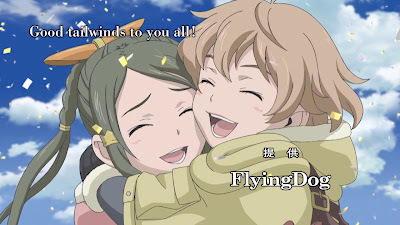 While GONZO hasn't always produced top-notch series, Last Exile is definitely one of their flagship animes that showed us they indeed are a production powerhouse. However, after they made some bad decisions to produce lots of less-than-mediocre series instead of fewer good series, they were forced into bankruptcy. This new pseudo sequel to Last Exile, can be seen as the first real product of the newly reformed GONZO after they emerged from bankruptcy. Overall, I have to say they've done a decent job. To make the plot less complicated, they chose to use two female lead characters so romance wouldn't be getting in the way of the central plot's development. The biggest difference, however, is that instead of a conventional villain, an antihero took the role to appose the heroines of the story. Though it's only a simple swap of role, the effect it had towards the overall feel of the story is actually large: in the original Last Exile, there's always someone everybody could hate on--the villain; in this case however, it's really difficult to place blame of the misfortune of everybody on the antihero because everybody, hero or the antihero all had noble intent. It's just that different people had different perception about what's good and what's evil, and how much evil is acceptable in order to obtain greater good. That has always been something people have struggled with, whether in history or in fiction. I'm really glad this story made this the focus of the plot because personally, I'm always intrigued about how different authors attack this topic. Even though the plot became increasingly predictable towards the end, what it built up to that point is still rather moving. Recommendation: This new Last Exile is a good story, and I found it particularly interesting about how they fit the casts of original series in. Criticize as you may, but I think GONZO had finally produced another worth while anime.